A few of the 17 blurb responses . . . .
A thorough and entertaining survey of what’s wrong with secular scholarship on Jesus, why most scholarship on Jesus isn’t really secular, and why the possibility that Jesus was mythical needs to be taken seriously. Every Jesus-myth enthusiast will want to read and reference this one. His demonstration that an alarming number of Jesus scholars are actually contractually required to deny mythicism is alone worth the price of admission. His also revealing the embarrassing truth of how historicist scholars contrive even more flawed or ridiculous theories than mythicists is just gravy. 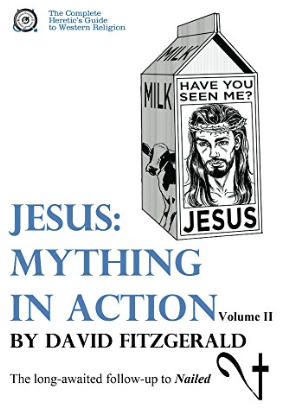 Jesus: Mything in Action, David Fitzgerald’s follow-up to Nailed, asks piercing questions that won’t go away. If Christianity began with a historical Jesus, then where is he? Why is he a no-show in every written work outside of the gospels? And if we can trace the literary and theological antecedents of every gospel story, is the historical Jesus even necessary? David takes us on a gripping journey through time to show where the myths of the heavenly Christ as well as the legends of the historical Jesus came from. But no matter where or when we look, Jesus of Nazareth himself is the man who wasn’t there. Don’t myth it! Take your book off the shelf, Tom Aquinas, your Summa Theologica is being replaced by David Fitzgerald’s Summa Mythologica! 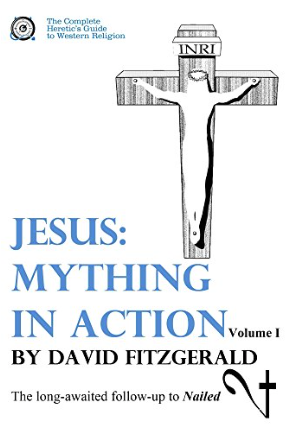 Jesus: Mything in Action is the most nearly exhaustive synthesis of evidence indicating the non-historicity of Jesus of Nazareth ever written. Best of all, it’s written in breezy English prose—not the labyrinthine Latinate crime so often committed when discussing “sacred subjects.” The organizational logic of the book is impressive; it reminds me of Euclid’s Elements. 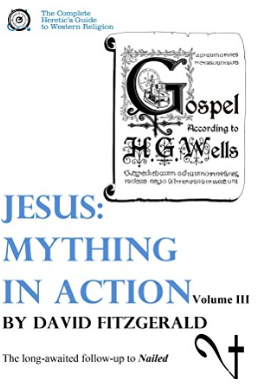 Historical Jesus scholars should not be fooled by the ease with which this book can be read by the educated layperson: this book is a must-read for Jesus specialists also Mything in Action is a milestone along the long path to progress in Mythicist studies. And my own little addition to the blurb. . . . Brilliant, very readable and comprehensive. A wideranging discussion of the evidence for Jesus demonstrating that it is exactly what we should expect if Jesus began not as a historical figure but as a theological and literary invention. David Fitzgerald’s opening chapters are especially noteworthy as a wonderful breath of fresh air for anyone who has read the diatribes of scholars hostile to the Christ Myth hypothesis. Partly with the assistance of some original research Fitzgerald exposes just how self-interested, strained and nonsensical those attacks have been. Mything in Action, vol. I (chapters 1 – 12) looks at the myths of Jesus Mythicism: what it is and isn’t; what biblical scholars are saying about it (and why); and examines our oldest “biographical” source for Jesus – the allegorical story we know as the Gospel of Mark. Mything in Action, vol. II (chapters 13 – 18) discusses the changing Jesus from even before the earliest Christians, to Paul, to the Book of Hebrews, to the Gospels and beyond: the construction (and deconstruction) of the Gospels; how Jesus is presented in the rest of the New Testament; and examines the historical sources for Jesus outside of the Bible. Mything in Action, vol. III (chapters 19 – 25) presents a bold thought experiment: “The Gospel According to H.G. Wells,” a multi-chapter time travel expedition through the origins and evolution of Christianity.